1. 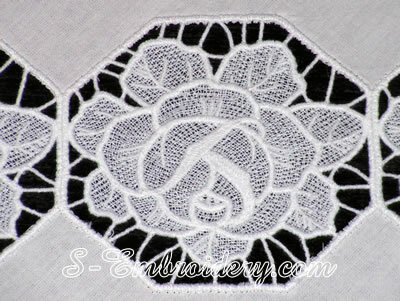 Stitch the design on water-soluble stabilizer. You can use stabilizer of your choice. In this case we have used Gunold's Stickma Solvy. 2. Cut away the excess stabilizer and place the embroidery into water for some time (follow instructions of your brand's manufacturer) to dissolve stabilizer. After it has dissolved you could rinse the design in running water to remove any remnants. 3. Let the design dry. 4. 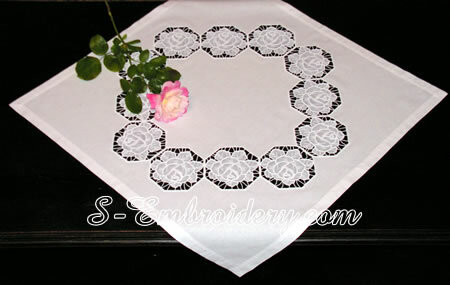 Repeat operations 1-3 as many times as needed in order to get the desired size and shape of your table cloth. 1. Hoop the fabric and water-soluble stabilizer together. You can use stabilizer of your choice. 2. Stitch color #1 so that the fabric and the stabilizer are stitched together. 3. Do NOT take the fabric and stabilizer off the hoop. Cut out the fabric from the INSIDE of the octagon shape you stitched out. Take care NOT to damage the stabilizer beneath. It MUST remain intact. 5. Place the embroidery into water for some time (follow instructions of your brand's manufacturer) to dissolve stabilizer. After it has dissolved you could rinse the design in running water to remove any remnants. 6. Let the embroidery dry out.